It's another special edition of the Pizza Blog. We were joined by Miro's dear college friends. Since they have picked up delightful spouses (who are willing to partake in our hi-jinx, yay!) and commenced the spawning process, for this edition, it was off to Bertucci's, where high chairs are in abundant supply. See if you an tell which parents wrote their reviews with the crayons they provided the kids. Miro's Comments: It's a pretty looking pizza, but I miss cheese on my pizza. Can you get a plain cheese pizza here? 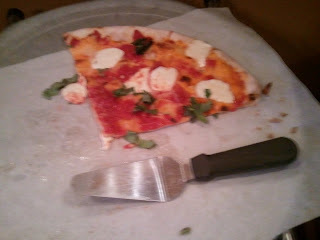 We got the Margherita because it seems to the closest thing. John's Comments: Artisanal in a Mall of America way. Alicia's Comments: Looks kind of dry. Bobby's Comments: Basic non-specialty pizza look. Alicia's Comments: Slight basil smell. I would like more tomato. Alicia's Comments: Not very hot. Bobby's Comments: Fine to slightly cool. Miro's Comments: ah - the flavorless dollop! Bobby's Comments: Cheese dollops are a bit too small, but tasty. Elizabeth's Comments: Tomatoey and fresh, but only a very thing layer. Alicia's Comments: Taste is good, but I want more of it. Bobby's Comments: Slightly sweet … not too bad. Miro's Comments: For a pizza that's all crust, you'd hope for a slice of fabulous … you'd be disappointed. Elizabeth's Comments: Soggy where sauce is, burnt in other spots. Bobby's Comments: As they say on the interwebs, doughy pizza is doughy. Miro's Comments: I'm sad they didn't give me a ball of dough to play with! Alicia's Comments: Not bad, but a little dry. Bobby's Comments: The solid utility infielder of pizzas. Never going to win an award, but often needed in a pinch. Jocelyn's Comments: Will not reject it.